In 1936 the Luftwaffe published specifications for a long-range strategic fighter. 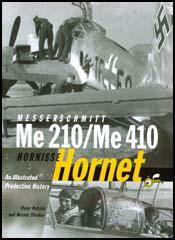 The Messerschmitt Bf 110 was designed in 1934 and made its first flight on 12th May 1936. The Messerschmitt BF 110 was an all-metal twin-engine aircraft, with a three crew housed in a long enclosed cockpit. Powered by two Daimler Benz engines, it had a maximum speed of 336 mph (540 km) and had a range of 680 miles (1,094 km). It was 39 ft 7 in (12.07 m) long with a wingspan of 53 ft 4 in (16.25 m). The aircraft was armed with 5 machine-guns and two 20 mm cannons. The aircraft performed badly during the Battle of Britain and was redesigned. 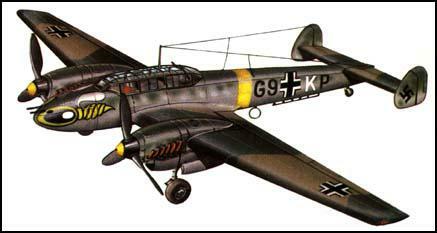 The installation of radar equipment made it the best night fighter in the Luftwaffe. The Messerschmitt A. G. company produced over 5,900 of these aircraft between 1936 and 1945.